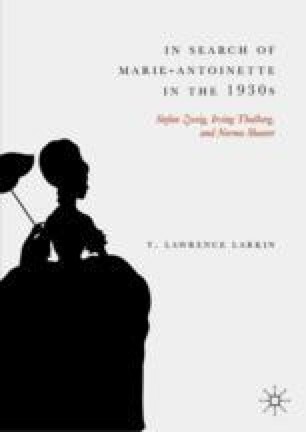 This chapter discusses Irving Thalberg’s early production plans for a biopic of Marie-Antoinette in terms of a dialectic operating among story editor, producer, star, director, and contract writers at Metro-Goldwyn-Mayer. It begins by locating Thalberg’s film productions of the early to mid-1930s in relation to past trends in European and American biopics. It then discusses the development of the screenplay according to standards of historical research and narrative plausibility, attending to Marie-Antoinette’s flirtation with the duc d’Orléans as an ambitious politician and the comte de Fersen as an absorbing lover in the first half, and her loyalty to Louis XVI and the institution of monarchy in the second half. The discussion further shows that the producer’s script stayed relatively faithful to the biography’s thesis about the king’s crucial sexual problem and queen’s consequent desire for diversion despite pressure from the censor to pursue a traditional “sin and atonement” narrative. Finally, it presents Thalberg’s assessment of Shearer’s suitability for such a role. Anonymous. 1926. An Act from “The Unchaste Chased Woman,” Hearst Castle, San Simeon. YouTube: https://www.youtube.com/watch?v=HxNeuvf2yxk.